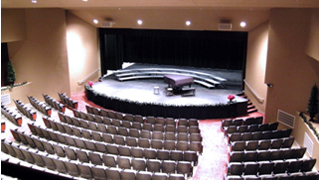 Project Description : The performing arts addition to the Galva-Holstein School opened in 2010. The additon includes a 400 seat performing arts theater and associated support spaces. The building infills the space between the original school and two previous additions which resulted in many different interfaces between the new and existing construction that had to be addressed during design. It was determined that the most cost effective construction was to utilize masonry bearing walls inconjunction with open web joist roof framing. Spread footings were used for the foundation. An entry canopy with multiple sloping pipe columns at each support location is a distinctive architectural feature. 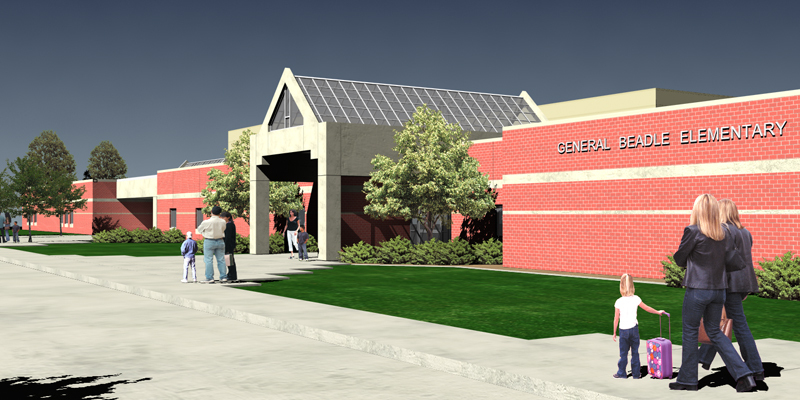 Project Description : The new auditorium for Rapid City's Central High School is a 680-seat multipurpose performing arts space for drama, music, dance, lyric theatre, and lecture use. While there is no balcony, the seating and aisles are efficient yet comfortable with excellent sightlines to the stage. The stage is tall enough to allow flown scenery and the rigging provides safe access for servicing light and curtains and tracks. Over the stage is modified gridiron system that allows for regular servicing and some special rigging while not reducing the fly height. The rigging system is a combination of motorized to fly the heavier and slower lighting and shell safely and manual for the lighter curtains and scenery. There is a complete orchestra shell with rolling towers and flown ceiling with integral concert lighting to enhance band, chorus, and orchestra sound. The stage floor is on rubber pads for resiliency to support dance and aid orchestra. State of the art networked lighting controls are rubber pads for resiliency to support dance and aid orchestra. State of the art networked lighting controls are included with just under 300 circuits. Energy saving LED lighting, not requiring relamping for a very long time, is used for house lighting as well as for some production lighting. The auditorium is supported with shops, dressing and make-up space, some storage, a band rehearsal room, as well as lobby and audience amenities.